Every Wednesday between mid-morning and mid-afternoon, Hotwells resident, Mike Timmins sets up FABRICation on the ground floor of the CREATE Centre. 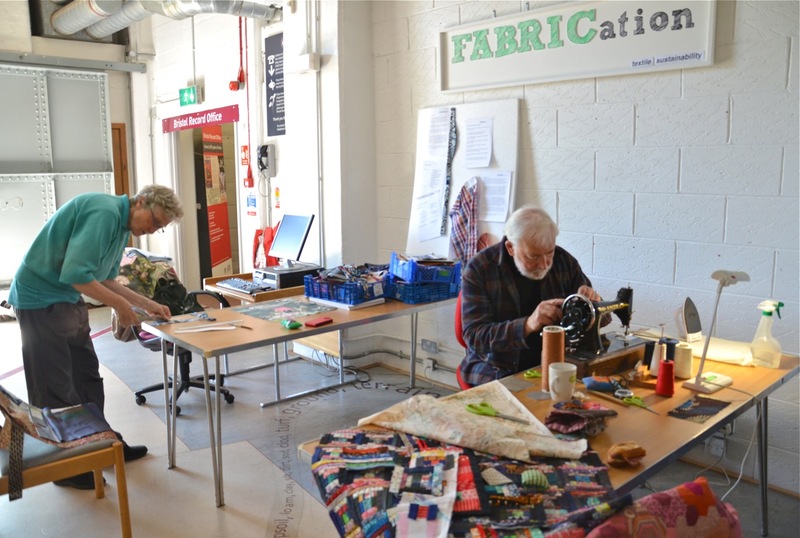 His aim is to share his experience of the textile industry and lifespans of textiles, highlighting environmental, economic and social aspect of production and waste. FABRICation is a live activity, with projects in progress using waste textiles to produce useful and attractive items. These projects include cushion covers, wall hangings, tea cosies and the like, and will vary each time that FABRICation is open. When I went to visit Mike, as well as reading all the information on his beautiful display boards, I learned that if we don’t weather proof the fabrics we put in our black boxes they will end up in landfill. Apparently it’s expensive and wastes energy to dry the fabrics before (usually) shipping them overseas to be re-used or recycled. So, if those fabrics are unsuitable for charity shops, be careful with your weekly recycling- or let’s find a more local solution! Pop in and have a chat with Mike. Activities will vary from week to week, so there will always be something different going on! Just met Mike. Amazing man, amazing story and extremely down to earth/humble. Gave me great advice about life…the exact words I needed after I’ve been pondering!